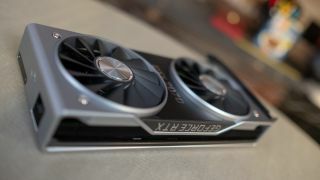 An unidentified Nvidia GPU has shown up on UserBenchmark with performance that fits it neatly between a GeForce RTX 2070 and GeForce RTX 2080. The benchmarks were shared by Twitter user Momomo_US, but the fine details about the GPU are dubious. It's not implausible that Nvidia is planning on a GeForce RTX 2070 Ti to fit between its 2070 and 2080. It's released Ti variants in the past to fill gaps, but it feels early for an RTX 2070 Ti to begin with. Nvidia's GTX 1070 Ti didn't premier for more than a year after the GTX 1070. The RTX 2070, meanwhile, hasn't even been on the market for half a year. The early leak of this benchmark may not mean too much, since Nvidia hasn't said anything about a launch, so there could still be plenty of time before an announcement and public release. But, there are some other details that don't make this seem like a likely product. According to the data in the benchmarks, the graphics card has a core clock of 1,590MHz. This is a decent step above the base clock of the RTX 2070, which sits at 1,410MHz. However, UserBenchmark data for the RTX 2070 shows core speeds in the ballpark of 2,100MHz, so it's unclear whether the clock speeds shown for the unidentified card are actually base clocks. It's possible the card could have lower clocks but a higher core count to achieve its higher performance, but the memory situation also raises questions. The benchmark shows 7.5GB of GDDR6 memory for the unidentified graphics card. Compare that to the 8GB found on both the RTX 2070 and RTX 2080, and it doesn't fit neatly in the middle. Neither does the 3,150MHz memory speed. The RTX 2070 shows up with a memory speed of 3,500MHz in UserBenchmark. So, for this card to be an RTX 2070 Ti while having lower core clocks, less VRAM and lower memory speeds, Nvidia would need some very clever marketing to sell it. It makes even less sense when considering what it would go up against. AMD's Radeon VII competes directly with the RTX 2080 in price and performance. If the AMD card had occupied the void between the RTX 2070 and 2080, then a new 2070 Ti would make a lot of sense. But, that's not the case. Given all of the odd details, this leaked benchmark doesn't seem incredibly plausible as an RTX 2070 Ti.